Vanuatu’s inaugural Rugby League Test Captain James Wood will return to lead Vanuatu into battle at Chapius Stadium on Saturday 11th October, 2014 when the VRL take on the might of the Asian Champions in the Philippines Rugby League team, known as the Tamaraws. Mr Woods hails from Malo an island a short 30 minute boat ride away from where the game will be played in Luganville on the island of Espirtu Santo (Vanuatu). Mr Woods said despite missing the Test Match victories in 2013 over the Solomon Islands and Niue due to injury; captaining the Vanuatu team in the inaugural Test match in Port Vila (Vanuatu) in 2012. “Having the honour of captaining my country was a proud moment and the highlight of my Rugby League career. I’m looking forward playing in Santo will all my family and friends from Malo with the rest of Santo cheering me on”, Mr Wood’s said. 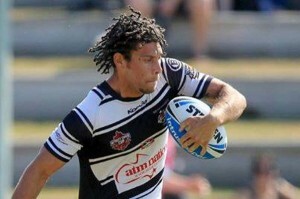 Woods who also captains the Tweed Head Seagulls in the Queensland Cup where he recently played a club record 200 games. Woods also holds the record for most tries with 94 and is the clubs 3rd leading point scorer. The Seagulls club is proudly sponsoring Woods to play in the game in gratitude to the service he has given the club over 12 seasons. Woods was instrumental in providing an opportunity for Test Centre Nelson Law and former utility Kunro Kalo to spend a year with the Tweed Heads Seagulls where they played in the clubs A Grade team throughout 2013. Seven other players that are Australian based will join Captain Woods in the squad, including Samuela Loaloadravu who stepped in to captain the side in Woods absence in 2013. The VRL’s halfback and all-time leading point scorer Joshua Tanner is also part of the squad that includes front rower Sam Pierce that plays for the Central Queensland Capras in the Queensland Cup and trained with the Brisbane Broncos NRL team over the last pre-season. It will also be a home coming for players raised in Santo including Erick Tosusu and cousins Herbie Henderson and Anthony Delaivuna. Their cousin rising star Ben Henderson, whose team Endeavour Sports High School recently won the Australian School Championship and is part of the Cronulla Sharks NRL U/20’s team will be a non-playing member of the squad to gain experience in the national set-up. Interim coach and former player John Nash was very pleased with the high quality of players that will form the squad. “All the players selected bring a wealth of experience playing in Australia and all have formerly represented Vanuatu. They are the perfect group to mentor our highly talented but largely inexperienced group of predominantly Vanuatu based players with those players to be announced in the coming days”, Mr Nash said. The Test match will also feature the annual inter-provincial match between the Port Vila representative side and the Santo Boars. This entry was posted in Uncategorized on October 2, 2014 by Ben Howard.